Fundamentals of Organizational Behavior: An Applied Perspective, Second Edition examines the behavior of people in organizations. Topics covered range from political maneuvering in organizations (office politics) to the stresses facing people in managerial and professional positions. 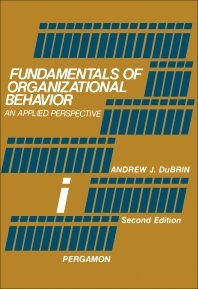 A conceptual framework for organizational behavior is presented, along with numerous case illustrations and examples from live organizational settings. This monograph consists of 14 chapters and opens with an introduction to organizational behavior and how it is influenced by principles of human behavior. The three main subareas or schools of management thought are discussed, together with the difference between knowledge work and non-knowledge work; how research and theory contribute to an understanding of organizational behavior; and the distinction between structure and process. The following chapters explore how the meaning of work relates to work motivation, as well as the link between work motivation and job performance; behavioral aspects of decision making; stresses in managerial and professional life; and political maneuvering in organizations. Small group behavior, leadership styles, and interpersonal communications are also considered, along with intergroup conflict and organizational effectiveness. This book will be of interest to students, managers, and staff specialists, as well as behavioral scientists and management theorists. An Organizational Behavior Minicase: How Do You Motivate This Man? What Functions Does a Group Perform? An Organizational Behavior Self-Insight Exercise: What Kind of Leadership and Followership Style Best Describes You? An Organizational Behavior Minicase: Why Don't People Tell Me These Things?